Ht / Wt: 6'1" / 211 lb. 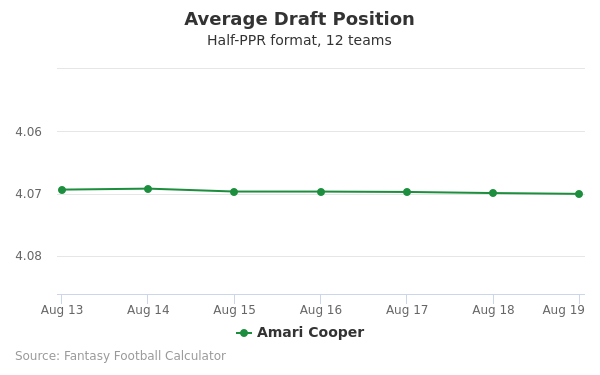 Amari Cooper's fantasy value is measured by his average draft position (ADP) in fantasy football mock drafts. 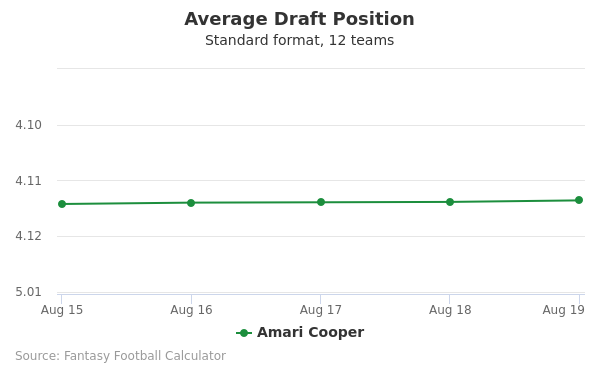 In recent drafts, Cooper's current ADP is 3.11, which indicates that his fantasy outlook is to be the 11th pick of the 3rd round, and 34th selection overall. 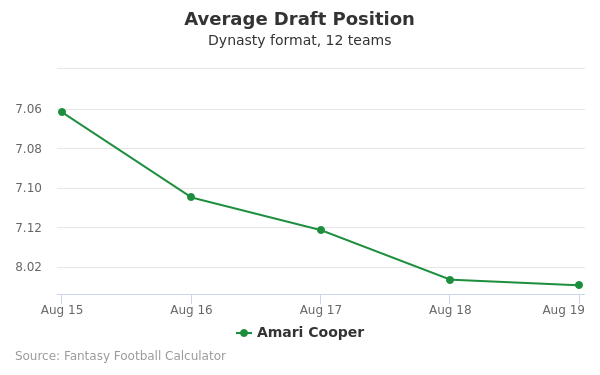 The code below will display a graph that updates every day to show the ADP data for Amari Cooper for the past 30 days in 12-team PPR leagues. Draft Amari Cooper or Phillip Lindsay? Draft Amari Cooper or Derrick Henry? Draft Amari Cooper or Stefon Diggs? Draft Aaron Rodgers or Amari Cooper? Draft Amari Cooper or Devonta Freeman? Draft Amari Cooper or Chris Carson? Draft Amari Cooper or Brandin Cooks? Draft Amari Cooper or Derrius Guice? Draft Amari Cooper or Kenny Golladay? Draft Amari Cooper or Andrew Luck? Draft Amari Cooper or Kerryon Johnson? 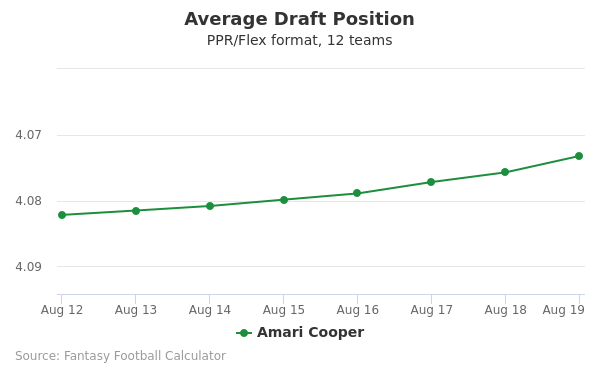 Draft Amari Cooper or Cooper Kupp? Draft Amari Cooper or Eric Ebron? Draft Amari Cooper or Robert Woods? Draft Amari Cooper or Julian Edelman? Draft Amari Cooper or Tarik Cohen? Draft Amari Cooper or Baker Mayfield? Draft Amari Cooper or Jarvis Landry? Draft Alshon Jeffery or Amari Cooper? Draft Amari Cooper or O.J. Howard? Draft Amari Cooper or Tyler Boyd? Draft Amari Cooper or Tevin Coleman? Draft Amari Cooper or Kenyan Drake? Draft Amari Cooper or Will Fuller? Draft Amari Cooper or Deshaun Watson? Start Amari Cooper or Phillip Lindsay? Start Amari Cooper or Derrick Henry? Start Amari Cooper or Stefon Diggs? Start Aaron Rodgers or Amari Cooper? Start Amari Cooper or Devonta Freeman? Start Amari Cooper or Chris Carson? Start Amari Cooper or Brandin Cooks? Start Amari Cooper or Derrius Guice? Start Amari Cooper or Kenny Golladay? Start Amari Cooper or Andrew Luck? Start Amari Cooper or Kerryon Johnson? Start Amari Cooper or Cooper Kupp? Start Amari Cooper or Eric Ebron? Start Amari Cooper or Robert Woods? Start Amari Cooper or Julian Edelman? Start Amari Cooper or Tarik Cohen? Start Amari Cooper or Baker Mayfield? Start Amari Cooper or Jarvis Landry? Start Alshon Jeffery or Amari Cooper? Start Amari Cooper or O.J. Howard? Start Amari Cooper or Tyler Boyd? Start Amari Cooper or Tevin Coleman? Start Amari Cooper or Kenyan Drake? Start Amari Cooper or Will Fuller? Start Amari Cooper or Deshaun Watson? Amari Cooper was born on June 17, 1994 in Miami, Florida. He spent his youth growing up in a poor section of Coconut Grove, raised by his mother, along with his four sisters. Amari attended Miami Northwestern High School, where he stared not only as a football player, but basketball and track too. His senior high school season saw Cooper catch 33 balls for 722 yards and 6 touchdowns. He was teammates of the Minnesota Vikings quarterback Teddy Bridgewater. Cooper chose the University of Alabama as his college. He played three years at Alabama under Coach Nick Saban. He led Alabama in receiving his freshman year as Alabama won the National Championship. He had a decent sophomore season but injuries slowed him down from producing as he did during his freshman campaign. It was his junior season where Cooper truly begun to get the praise for his efforts as he broke numerous records at Alabama. His junior totals of 124 receptions, 1,727 yards and 16 touchdowns all were records. He won the Biletnikoff Award for best receiver in college, he was a unanimous All-American, and he finished 3rd place in the Heisman Trophy selection. His college highlights video is available online. It was after his junior season that Cooper declared for the 2015 NFL draft. The hopes were high for Cooper not only at the NFL Combine, but the NFL Draft. His desire to leave the combine as the number 1 receiver prospect showed as he maneuvered his way through the combine skills. Cooper measured in at 6’1” 210 pounds. He ran a nice 40 time in 4.42 seconds, a vertical of 33’, and was the combines top performer in both the 3 cone drill and 20 yard shuttle. His route-running really caught the eye of the scouts as well as his ability to catch the ball. Based on all this, the Oakland Raiders selected Cooper with the 4th pick in the 2015 draft. You can view Amari Cooper’s full draft profile here. Sporting number 89, Cooper began his rookie season with high expectations, not only by the Raider Nation, but himself as well. Coming out of Alabama and being the fourth overall pick in the 2015 NFL Draft, a lot of promise followed him into his rookie campaign, especially with his size and footwork. He did not disappoint. By game 11 of his rookie season, Cooper had tied the Raiders rookie pass catch record with 44 and the following week he broke the record. That week he also broke the Raiders rookie record for yards receiving. He finished his rookie season with 72 catches, 1,070 yards and six touchdowns. Cooper also benefited from having an injury free season. Cooper signed a four year contract for $22,663,116 that included a signing bonus of $14,742,226. His base salary for 2015 was $435,000. Coopers 2016 season came with more promise after his stellar rookie season. Once again, he did not disappoint. His pass catch totals and receiving yards both increased, with 83 catches and 1,153 yards but he saw his touchdown total drop to five. Cooper’s presence on the field caused concern for most NFL defenses but his ability to increase his totals only shows the dedication he has to his craft as a receiver. A summary of his 2016 performance is available through his 2016 highlights video. His childhood wasn’t an easy one as he often went without, but his mother taught him how to work hard, a trait he took with him to high school, then to college, and now into the NFL. He lives a very private life and is a devout Christian, something that has helped him up to this point in his life. His twitter handle is @AmariCooper9.